4.0 颗星，最多 5 颗星Beautiful book! As a huge fan of Blade of the Immortal, this was a wonderful treat. Hiroaki Samura collects artwork spanning from the creation of his comic until a few years ago, including the covers of the volumes and bonus illustrations that appeared elsewhere. As a bonus, the book is only thirty dollars, which was highly surprising, as it is filled with full-color illustrations and bound beautifully in hardback. Viewing the work huge and crisp is wonderful, as it is usually reproduced much smaller. We can enjoy Samura's illustrations up close and personal, as they are meant to be seen. The only drawbacks I can say is that if you are a big fan of his work, you've probably seen all of the pictures already, since many of them are covers to the trades. However, there is art I haven't seen before included in the book, and they even included the translated interview with the artist, which was great. Hopefully, Samura will release a book when the series concludes with the rest of the works, as he mentioned. Getting this in the mail was like opening a present at Christmas! 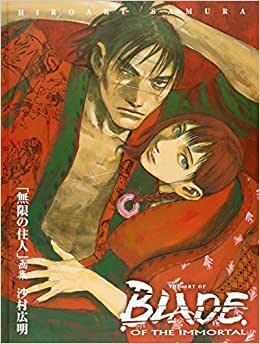 If you're a fan of Blade of the Immortal, the book is a must-have. And if you're not, you can still appreciate the mastery that is Samura's art. 5.0 颗星，最多 5 颗星Beautiful is an understatement. This book was a lot bigger than I expected it to be. The quality is astounding and all of the artwork is mesmorizing. So glad I bought this, it will go perfect with all the volumes of BotM. I only wish it came shrink wrapped to give it the collector's item feel but nonetheless a 5/5. Any fan of the series will enjoy this book though they may not find it completely satisfying, as it seems to short and leaves out other cover art and bonus material you can find in the comics or graphic novels that may have been worth including. The art contained within cannot be accurately described here in a review. If you are a fan of the series, this is all you are looking for and more. Color lieces, charcoals, black and whites. Amazing stuff, but you already knew that.